At this point, all of my readers and followers know my love for Tulum. It may not be Mexico’s best-kept secret anymore, but that doesn’t change the fact that it’s very easy to fall in love with this effortlessly cool jungle paradise. I love that it’s an off the grid, authentic and laid back getaway spot. If you’re looking an for an all-inclusive experience, you might as well stay in Cancun or Playa del Carmen. Tulum is a small, charming beach town that definitely stands apart for its more bohemian vibes—an effortless cool that translates to its recent influx of bars, restaurants, coffee shops, beautifully designed eco-chic boutique hotels, exceptional customer service, and delicious, healthy food prepared by gourmet chefs. Even spending a few days in this area fills me with inspiration, and I believe it has a magical healing power. After both of my trips to Tulum, I left feeling restored, recharged, and full of inspiration. If you’re planning a trip to Tulum, this might be the most helpful bit of advice you will read before you go. I had so many logistical questions about how to get there, places to stay, wifi, bugs, food, and cash, so I spent endless hours writing this guide and getting down to the nitty-gritty so I could share my Tulum travel guide with you. You can find a lot of articles online, but I wanted to share lesser known tips in addition to the more obvious ones. I hope these tips and experiences help make your trip one of the most memorable times of your life. 1) It’s a 2-hour drive from the Cancun airport so you either need to rent a car or take private transportation like a shuttle. I always prefer renting a car at the airport since it makes exploring much easier. I live in San Diego, so I usually cross the border and fly with Volaris Airlines from the Tijuana Airport. They offer a direct red-eye flight to Cancun, and it’s much cheaper than flying from San Diego or LA. This is especially true when booking your flights last minute – I booked mine 1-2 days before. I also recommend purchasing their V Club Membership, which costs $27/yr and gives you discounts for each flight – sometimes as much as $50! 2) Most places in Tulum are cash only. Most hotels and hotel restaurants accept credit cards, but none of the stand-alone restaurants do. While there are ATMs on Boca Paila (the coastal road), I recommend bringing cash with you. There is an HSBC bank in downtown if you need to exchange. 3) AC and Wi-Fi are not givens. If it’s important for you to have throughout your trip, I would check with the hotel before booking. 4) The hotels along Boca Paila can get expensive so if you’re on a budget, downtown Tulum (called Pueblo by locals), has cheaper accommodations and more local hotspots. 5) The town is solar-powered, and there are no streetlights — most hotels provide flashlights. The restaurants and nightlife are mostly open-air and in the jungle, and while they have a lot of natural methods of repelling bugs, you may want to be prepared with bug spray. 6) Summer (off-season) is my favorite time to go. The flights and hotels are a little cheaper, the crowds are thinner, and the daily breeze off the sea makes the heat bearable. I honestly don’t mind spending an entire week in Tulum lounging in a hammock just staring at the horizon and crystal clear turquoise waters, but you guys know that I’m an explorer and there’s plenty to do in Tulum so I recommend staying as long as you can. 1) Boca Paila: This narrow road is packed full of well-known boutique hotels, popular restaurants, and shops on one side and jungle views on the other. Even if you’re staying in downtown, this area is a must see. It’s one of the best places to get lost in the beauty of this rustic beach town. Most hotels offer free bikes to their guests, but my recommendation is to walk even though it’s a fairly long distance. If you’re patient enough to walk towards the other side of Boca Paila, you’ll find a super cute place called Matcha Mama, and it’s definitely worth a visit! It’s adorable and the employees are very friendly! As we enjoyed our matcha lattes, we did an impromptu photo shoot because it was such a pretty spot! 2) Tulum Downtown (Pueblo): It takes 20-30 minutes to drive here from Boca Paila. This is where the locals live and spend their time. Most of them work at the hotels on the beach, but they come back to this area after work. It still has a lot of touristy vibes since a good number of the tourists stop by in Pueblo. Quirky souvenir shops and incredible yet inexpensive restaurants are the focus of this area. It’s definitely a more affordable area to stay in. We stayed at Casa Santiago, a villa turned into a charming bed & breakfast. We loved that this place was very peaceful, far away from the hustle & bustle of Tulum Pueblo, and the staff was very friendly. There’s a pink wall with cacti right next to the hotel so make sure to snap a picture. Be on the lookout for the aqua vintage Volkswagen Beetle on the street of Casa Santiago. Not sure if it’s always there, but it was there throughout our stay. Late night street dance battles and mojito rooftop bars should be expected here. Two of my favorite coffee shops in Tulum happen to be in this area as well. Del Cielo is a great cafe for breakfast and Ki’Bok coffee shop has a beautiful, colorful courtyard lined with local palms. Both are definitely worth a visit. 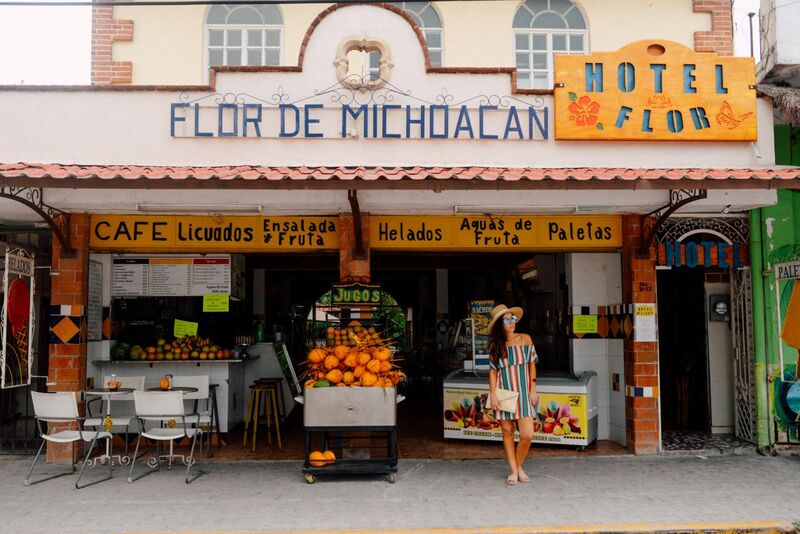 My favorite spot in Tulum Pueblo is La Flor de Michoacan aka Popsicle heaven. This paleteria is a total gem, even if you’re not a blogger 🙂 They have a variety of paletas (fruit popsicles) made daily with fresh fruit, juices, agua frescas, coffee, and desserts. The prices are much lower than getting a popsicle or ice cream in Boca Paila. We got the cream based ones because you can actually see the frozen fruit slices inside the paleta. The cream based ones are a little bit more expensive than the regular ones, about 40-45 pesos each. 3) Mayan ruins: There are a couple of Pre-Columbian Mayan ruins in the area, but my personal favorites are the one in Tulum and the one in Coba, which is a 2-hour drive from Tulum. The one in Tulum is perched precariously on a cliff and offers a breathtaking view that you can’t miss. Tip: Bring your swimsuit and take the stairs to the beach below the ruins. It’s open 8am-5pm and costs 40 pesos per person. The cenotes were worshiped by the Mayans as fresh water sources, and they’re perfect for snorkeling and scuba diving. This could be an all-day activity though, so be sure to plan ahead. I didn’t have time for it on my last two trips, but I’m already planning to go on my next visit! There are several different ones I’d like to visit such as Dos Ojos, Cenote Azul, Grand Cenote, Rio Secreto and Cenote Ik Kil. I heard it’s best to go early in the morning to avoid the crowds. Keep in mind that you need a ticket to enter the cenotes so make sure to have cash with you. Fun fact: There are more than 7,000 cenotes in Mexico’s Yucatán Peninsula! 5) Pablo Escobar’s Mansion (Casa Malca): If you haven’t seen photos of this place on my Instagram, you’re missing out! Please see my post about Pablo Escobar’s Mansion for more information. 6) Beach: Of course, you have to spend some time at the beaches in Tulum. I really enjoy going on beach walks and checking out other hotels in the area. That’s how I’m able to recommend hotels I haven’t stayed at, like Casa Malca. I’m good at sneaking into other hotels and taking a look around. You get a different perspective than what you would see from the entrances. Make your way to Raw Love next to the Ahua Hotel. It’s a super cute vegan cafe/coffee shop/restaurant. Located on the sand, under a palapa roof and covered by colorful hammocks and tables, it’s very Instagrammable. We only had coffee there, but I heard their raw vegan dishes are the best in Tulum. Coffee recommendation: the “Train Wreck”. 7) There’s also a Unesco World Heritage Site in Tulum. It’s called Sian Ka’an Biosphere and located on the South Side of Boca Paila (very close to Nest Tulum). I still haven’t been to this one either, but from my research, it’s full of cenotes, beaches and different species of birds and fish, but most picturesque are the large lagoons full of crystal-clear turquoise water. I’ve heard Kaan Luum Lagoon is a must-see for swimming and photos. 3) Casa Malca, detailed above. 4) Be Tulum: Ultra-hip, expensive and one of the most attractive design hotels in the area. 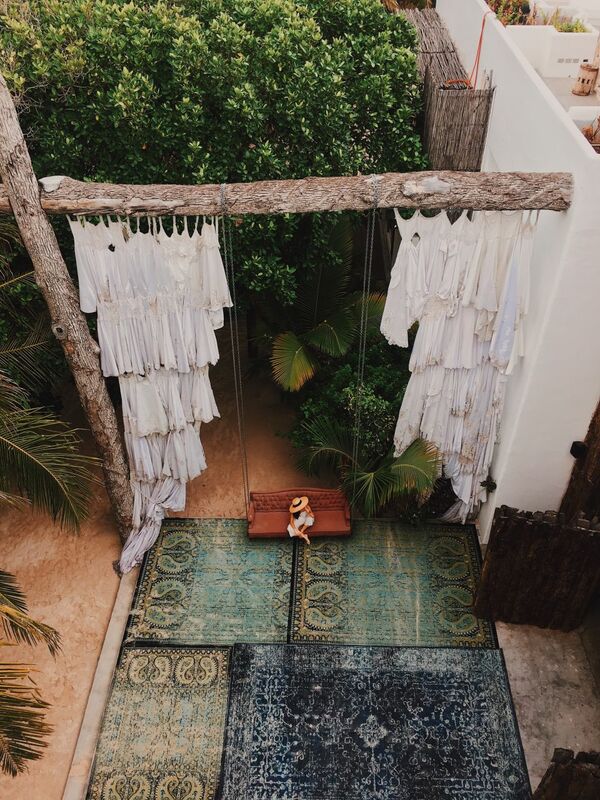 5) Nomade Tulum: Very popular with celebrities and fashion designers. Glamping style gratitude tents, and a super cute dining room which reminds me of the palaces from the Ottoman Empire era. I’ve also heard a lot about Yaan Wellness Spa, which is directly across the street from Nomade. I want to visit it next time and try one of their Mayan energy therapies or traditional Temazcal sweat lodge ceremonies. Sounds mystical, right? 6) Sanarà: Famous for its yoga studio that overlooks the beach, it’s one of the hotels that stood out to me while I was researching and exploring the design hotels in the area. Sanara means “you will heal” in Spanish, and the owners clearly wanted to make the hotel your very own sanctuary. 1) La Zebra Restaurant: Definitely try their fish tacos and shrimp & octopus tacos! They were probably the best tacos I’ve ever had! You’re going to have to try them for yourself, but the thick, homemade, blue corn tortillas really stood out. 2) Hartwood: Possibly the most famous restaurant in Tulum. It’s called the best restaurant in the whole area by many. Don’t forget to make a reservation as you don’t want to miss out! Everything is wood-fired, and the menu changes seasonally. I always ask the servers what they think of the new dishes and I recommend doing the same. They have an impressive wine list too. 3) Nest Tulum’s Restuarant (only open to hotel guests): Everything is made from scratch and you can even see the chef in action through the view to the little kitchen. We totally spied on him if you caught this funny moment on my Snapchat or Insta stories  Everything we had was super fresh and mouth-wateringly delicious, but the best part of having dinner here is eating and sipping your drink while listening to the sounds of the waves. My daily life is very stressful, and I’m always in a rush, so the relaxing dinner sessions at the Nest is something I already miss. 4) Casa Banana: This Argentine restaurant calls on the flavors and styles of Mexican cuisine using wood-fired ovens. Their jungle dining atmosphere, side dishes, and wine list full of well-aged wines from Argentina are worth mentioning. 5) Posada Margherita: A very sought-after Italian restaurant in Tulum! I haven’t had a chance to try this spot yet since I’m a big fan of eating Mexican food in Tulum, but I’ve heard great things and want to try it soon. 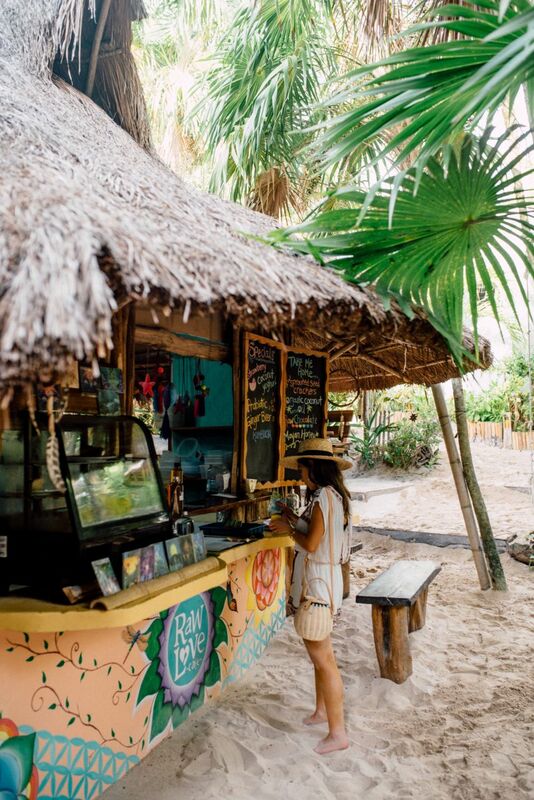 I’ve read an article where this restaurant’s vibe was mentioned as “Italy-meets-shack-on-the-beach-in-Mexico” and I think that’s worth a taste. 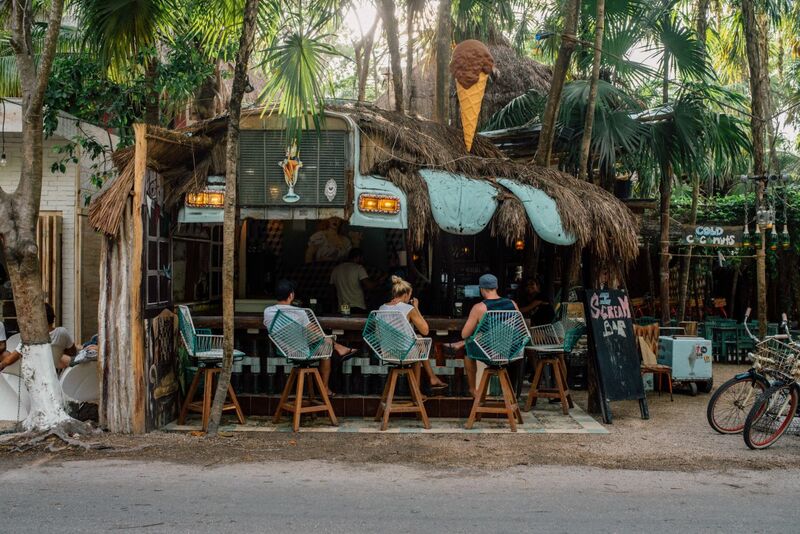 1) Gitano Tulum: One of the best spots in town for cocktails, dancing, and lite bites. Their creative cocktails like the Mescal Mule and Stardust are famous and well worth the price! 2) Be Tulum Hotel: If you’re into swanky experiences, this is your spot. Their spicy margaritas are a must try. 3) Casa Jaguar: Hit up this spot on a Thursday night for the full experience. 4) Batey Mojito Bar: Widely known for their Mojitos, Batey is the spot to get drinks and listen to live music in Pueblo. 1) Papaya Playa Project: This is the place to party in Tulum – especially on Saturdays nights. I can honestly say this was one of the best clubbing/late night beach party experiences I’ve been had. The DJ set was AMAZING and losing yourself to dancing on the sand while the wind is hitting your hair is an unforgettable experience. While I’m not a party girl anymore, I still love dancing and I would go there every night if I lived in Tulum. I heard their full moon parties are pretty cool too! 2) Casa Jaguar: Famous for their Thursday DJ set jungle parties. 3) La Zebra: On Sundays, the town heads to La Zebra for salsa on the beach. The live band starts around 9:30 and while everyone is welcome to join, sitting back and watching the feet fly is a lovely way to spend an evening. La Zebra also boasts a shockingly good cocktail program in case you were afraid of going thirsty. 4) Gitano Tulum: For some serious hip swinging, get yourself to Gitano on a Friday night. Tulum is a magical place and it’s so dear to my heart, I would love to live there for a bit. It’s a charming beach town that inspires a different way of thinking. The crashing waves and other soothing sounds, Insta-worthy hammocks, and all the peaceful moments in this town makes it all worth a visit! Have you been to Tulum? Where did you stay and what are your favorite spots? I’d love to know.